1Pre-Heat oven to 400 degrees. 2Cook the sausage over a medium heat for about 10 minutes or until the sausage is all a golden brown color (sausage should be 160 degrees). Break apart the sausage with a wooden spoon while it is cooking so it's all crumbly. 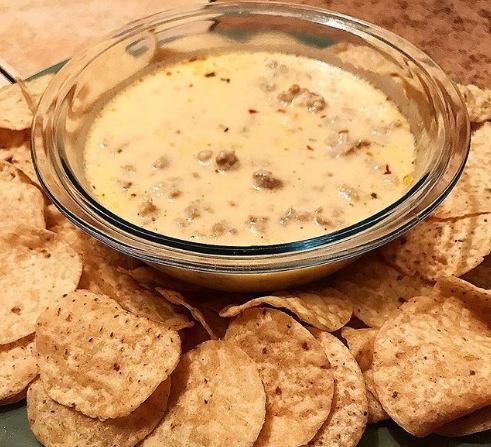 3While that is cooking, in a separate pan add Pepper Jack cheese, Munster cheese, Mild Cheddar cheese, cream cheese and 1/2 cup of milk and seasonings on a medium-high heat, stirring often. 4When the cheese mixture is all melted, add the sausage and a 1/2 cup of milk and mix together. Let it simmer on High for about 5 minutes. 5Carefully put all the mixture into an oven-safe dish and put it in the oven for 10-15 minutes, so the top can crisp up. 6Let it cool 5-8 minutes. 7Serve with your choice of Tortilla Chips and Enjoy! !